Pineapple upside down cake has to be one of the most beautiful looking and best-tasting cakes that exists. It is considered a classic American cake and the trick to making the beautiful top happens when you flip it as you remove it from the oven. For a mini version of this recipe, you will love our pineapple upside down cupcakes. And make sure you check out this berry upside down cake as well – it’s divine! Great news, this recipe only calls for the most basic ingredients as far as cakes go, so it’s likely you’ll have most of what you need in your pantry already. 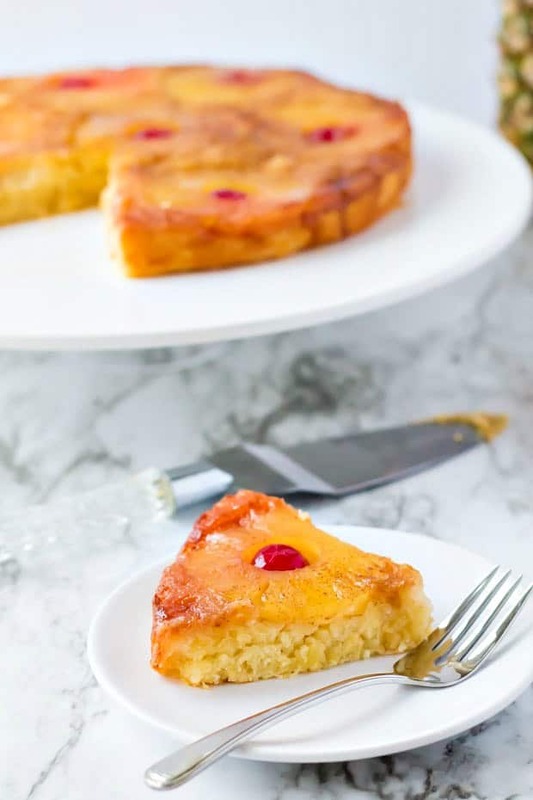 With this from scratch pineapple upside down cake recipe, you’ll have a soft vanilla cake with the perfect pineapple and cherry glazed top. It’s almost too beautiful to eat once it’s finished! But, don’t let that stop you, because honestly, it tastes even better than it looks. 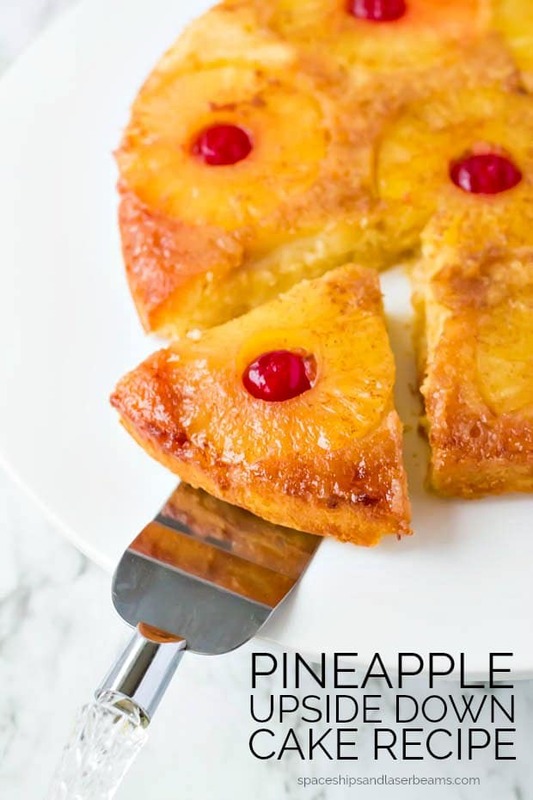 Pineapple upside down cakes CAN take some practice to get it just right, but the recipe we are sharing today is so easy and fun, anyone can enjoy making it! Line a 10-inch cake pan with parchment paper. Add in the ingredients from the pineapple glaze (butter, brown sugar, cinnamon) and melt them together for 5 minutes. Then, arrange the pineapple slices over the sugar mixture and place a cherry in each ring. Set this aside for later. Using the ingredients from the cake batter, you will want to cream the softened butter, sugar and cream cheese in a stand mixer until it is light and fluffy. Next, in a medium bowl combine all of the dry ingredients. With the mixer on low speed, add to the cake batter ingredients slowly. First, beat in the eggs one at a time, followed by the vanilla and crushed pineapple until it’s all combined. Then, slowly add the dry ingredients until combined. Do not over mix! Finally, carefully spoon the batter over the pineapple and cherry glaze that is already in the pan. 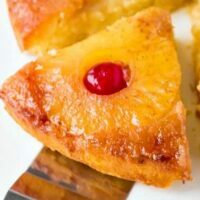 Bake a pineapple upside down cake for 30-40 minutes, or until a toothpick test comes out clean, and then remove from the oven. The beauty of this cake comes from the design created by the pineapple slices and cherries. It doesn’t need much more decoration than this. The combination of the two is pretty and colorful! The trickiest part to pineapple upside down cake is the flip. After you’ve removed the cake from the oven, let it cool for about 5 minutes. Then, you will want to flip the cake upside down onto a serving platter. The pineapples, cherry glaze part will become the top and your cake will be on the bottom. But, you can have a bit of fun with the way you arrange these in the bottom of the pan. Remember, in the end, you will flip the cake and this will become the top! So get creative and design the bottom of your cake with that in mind. You can also add dollops of whipped cream to the top for extra decoration. To store your pineapple upside down cake in the refrigerator you have a couple of options. If you have a cake storing Tupperware you can use that and place it in the fridge. If not, you will want to place toothpicks all over the surface of the cake. Then you can lay plastic wrap lightly over top of the toothpick and the plate that the cake is on. That way the plastic wrap won’t stick to the glazed pineapple and cherry top. If kept in the refrigerator, the pineapple upside down cake will last for about three days. Another option is to store your cake at room temperature. If stored this way, it will last for no more than two days. 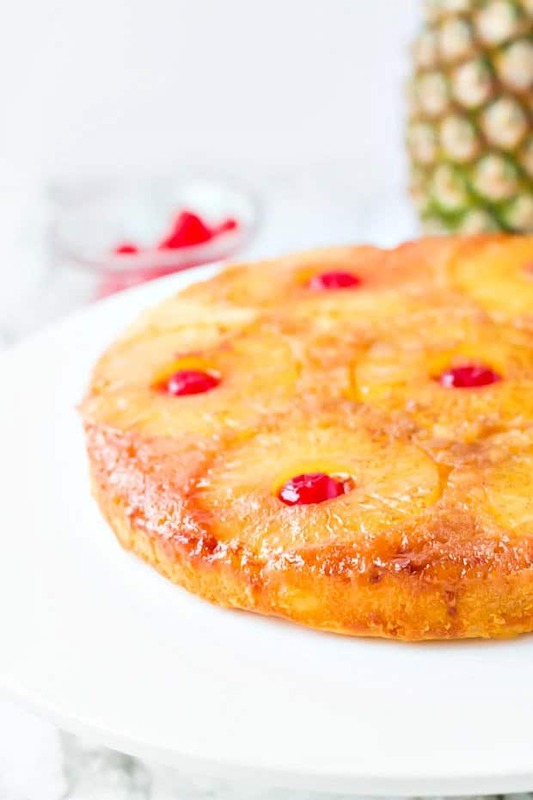 Can you freeze Pineapple Upside Down Cake? 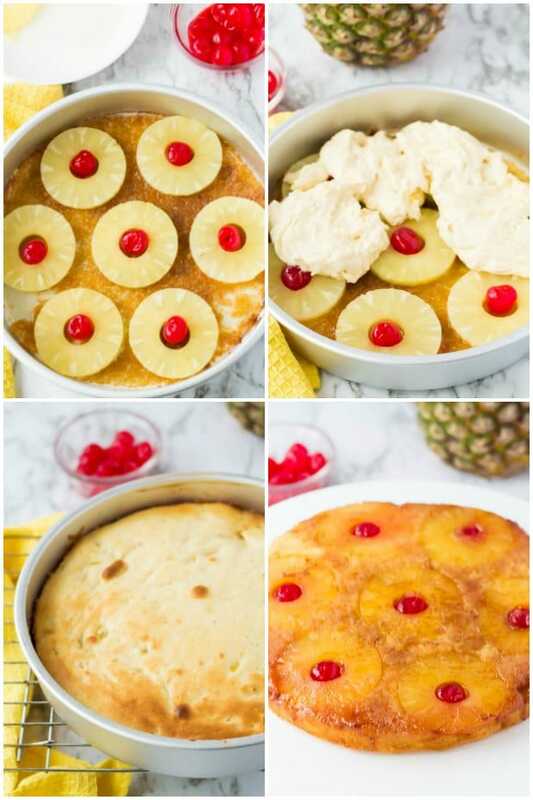 You most definitely can freeze your pineapple upside down cake. After you have flipped the cake onto a serving platter, let it cool down completely. Then, place it in the refrigerator overnight. In the morning, wrap your cake in plastic wrap and put it in a freezer bag or container. Leave it in the freezer until you are ready to serve. When the time comes, you will want to defrost the cake in the fridge, but be sure to take the plastic off before defrosting. Pineapple upside down cake is a traditional American classic dessert. It was delicious many years ago and it is still as delicious today. This beautiful cake is sure to be a hit no matter what the occasion that you are making it for. This classic dessert is a favorite for everyone that tries it! Pre-heat oven to 350 degrees. Line a 9 or 10 inch cake pan with parchment paper. Add the pineapple glaze ingredients to pan and melt for 5 minutes. Arrange pineapple slices over the sugar mixture and place a cherry in each ring. Set aside. Cream Butter Sugar and Cream Cheese in a stand mixer until light and fluffy. In a medium bowl combine dry ingredients. With mixer on low speed beat in eggs one at a time , followed by vanilla and crushed pineapple until combined. Slowly add dry ingredients until combined. Do not over mix! Carefully spoon batter over pineapples in pan. Bake for 30-40 minutes. Let cool for 5 minutes. Invert onto serving platter. This is one of my Papa’s favorites!